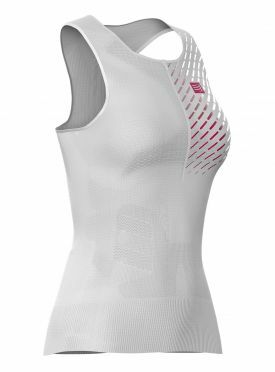 The Compressport Trail running postural sleeveless compression top white women is slightly compressive postural weaving supports your back muscles. Thermoregulated fibres guard against changes in external temperatures. Your body is kept warm and comfortable. Its ultra-ventilated mesh ensures sweat is wicked away while the light fabric counters feelings of fatigue. A pocket system ensures all your important accessories are within reach. 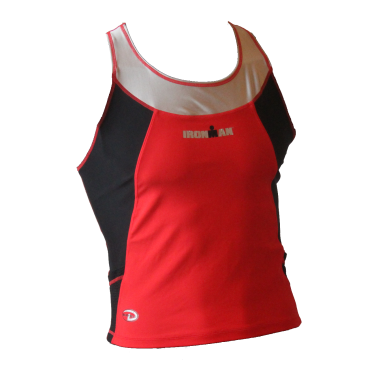 The Ironman Duofold sleeveless running top red/black men is a comfortable running tank top that keeps you cool and dry during exercise. The top has flat seams and 2 mesh pockets on the sides to carry important items or food. The top is made of a thin and soft fabric that provides efficient moisture transport. 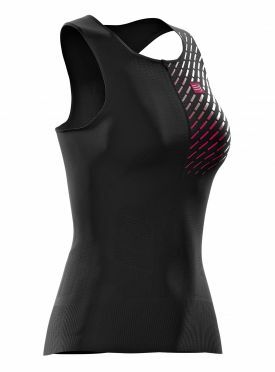 The Compressport Trail running postural sleeveless compression top black women is slightly compressive postural weaving supports your back muscles. 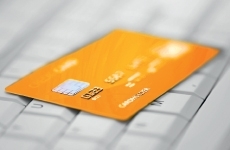 Thermoregulated fibres guard against changes in external temperatures. Your body is kept warm and comfortable. 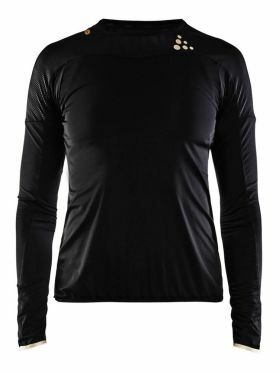 Its ultra-ventilated mesh ensures sweat is wicked away while the light fabric counters feelings of fatigue. A pocket system ensures all your important accessories are within reach. 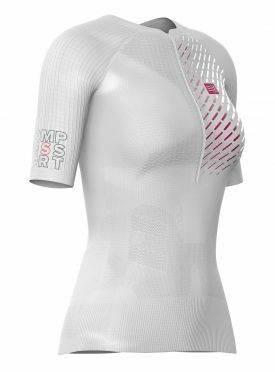 The Compressport Trail running postural short sleeve compression top white women is super light, highly ventilated and hydrophobic. It wicks away sweat and provides posture and support to the back and abdominal muscles. An ergonomic design, thermoregulated fibres and an advanced pocket system ensure total freedom, maximum protection from UV and easy access to your accessories. Its ultra-ventilated mesh makes it functional and comfortable. 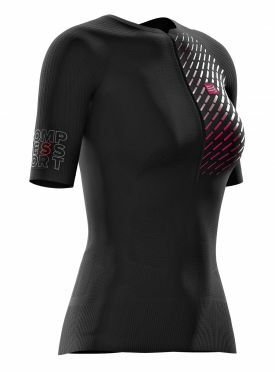 The Compressport Trail running postural short sleeve compression top black women is super light, highly ventilated and hydrophobic. It wicks away sweat and provides posture and support to the back and abdominal muscles. An ergonomic design, thermoregulated fibres and an advanced pocket system ensure total freedom, maximum protection from UV and easy access to your accessories. Its ultra-ventilated mesh makes it functional and comfortable. 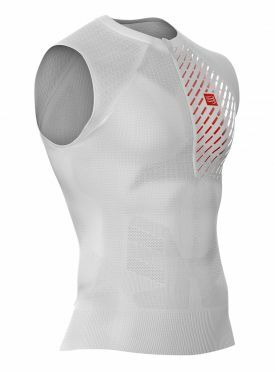 The Compressport Trail running postural sleeveless compression top white men is slightly compressive postural weaving supports your back muscles. Thermoregulated fibres guard against changes in external temperatures. Your body is kept warm and comfortable. Its ultra-ventilated mesh ensures sweat is wicked away while the light fabric counters feelings of fatigue. A pocket system ensures all your important accessories are within reach. 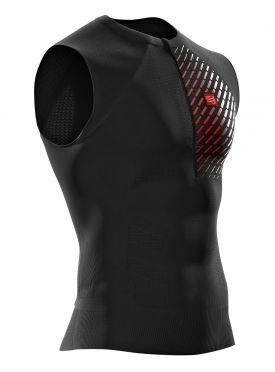 The Compressport Trail running postural sleeveless compression top black men is slightly compressive postural weaving supports your back muscles. 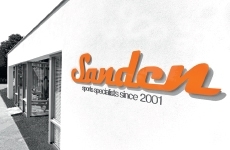 Thermoregulated fibres guard against changes in external temperatures. Your body is kept warm and comfortable. Its ultra-ventilated mesh ensures sweat is wicked away while the light fabric counters feelings of fatigue. A pocket system ensures all your important accessories are within reach. 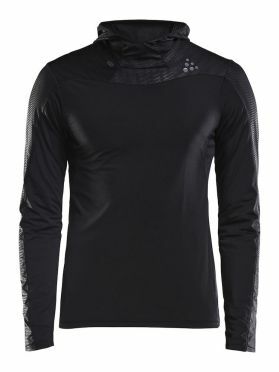 Shade Craft Shade long sleeve hoodie running shirt black men is a thin long-sleeve tee that protects against the sun’s harmful UV rays. The jersey is a perfect choice for runners with sensitive skin or for those who often run in sunny and warm conditions. The soft fabric offers efficient moisture transport, great cooling and helps you work out with optimal body temperature also on hot days. In addition, the item features mesh in armpits for targeted ventilation and longer back for extra protection. 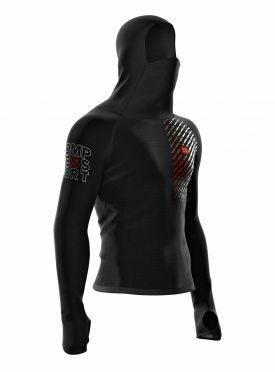 The key asset of this “athleisure” Compressport 3D Thermo Seamless woodpulp zip hoodie black is the Woodpulp-made fibre whose main characteristic is to bring softness and warmth to your sporty hoodie. It will guard you against the cold while you train or go out by a chilly day! Totally hydrophobic, the Woodpulp fibre wicks away moisture. Softer than cashmere, the Woodpulp fibre keeps warm and thermoregulates body temperature. 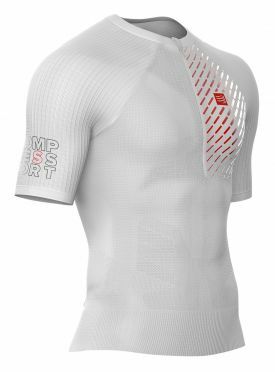 The Compressport Trail running postural short sleeve compression top white men is super light, highly ventilated and hydrophobic. It wicks away sweat and provides posture and support to the back and abdominal muscles. An ergonomic design, thermoregulated fibres and an advanced pocket system ensure total freedom, maximum protection from UV and easy access to your accessories. Its ultra-ventilated mesh makes it functional and comfortable. 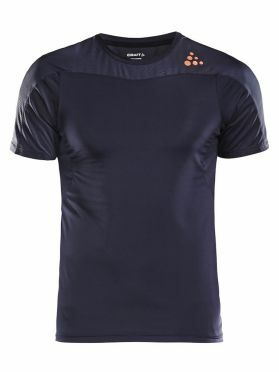 The Craft Shade short sleeve running shirt gravel/blue men is a thin running tee that protects against the sun’s harmful UV rays. The tee is a perfect choice for runners with sensitive skin or for those who often run in sunny and warm conditions. The soft fabric offers efficient moisture transport, great cooling and helps you work out with optimal body temperature also on hot days. In addition, the tee features mesh in armpits for targeted ventilation. 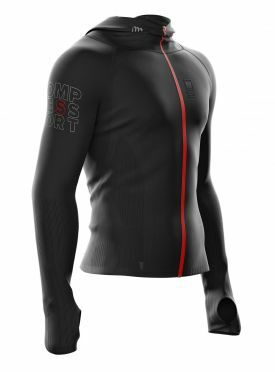 The Compressport 3D Thermo ultralight racing hoodie black micro-fibres offer thermal protection and guard against the elements. The 3D thermo ultralight ﬁbre is ﬂexible as it allows the hood to follow your natural body contours and head motion. Its lightweight but strong fabric protects your forearms from shocks and vibrations. Not in use, it folds easily into a small compact size, ideal for backpacks and pocket. 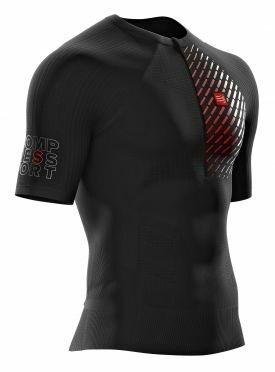 The Compressport Trail running postural short sleeve compression top black men is super light, highly ventilated and hydrophobic. It wicks away sweat and provides posture and support to the back and abdominal muscles. An ergonomic design, thermoregulated fibres and an advanced pocket system ensure total freedom, maximum protection from UV and easy access to your accessories. Its ultra-ventilated mesh makes it functional and comfortable. 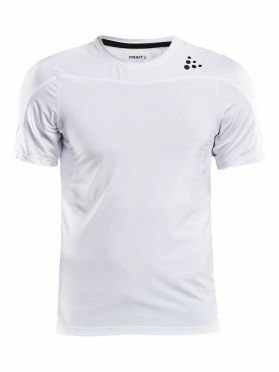 The Craft Shade short sleeve running shirt white men is a thin running tee that protects against the sun’s harmful UV rays. The tee is a perfect choice for runners with sensitive skin or for those who often run in sunny and warm conditions. The soft fabric offers efficient moisture transport, great cooling and helps you work out with optimal body temperature also on hot days. In addition, the tee features mesh in armpits for targeted ventilation. 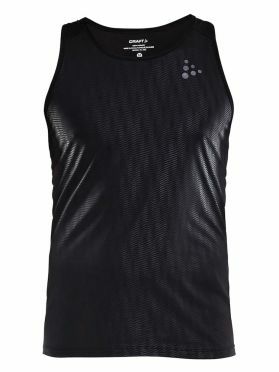 The Craft Shade sleeveless running shirt black men is a thin running singlet made of a functional fabric with UPF 50+. The soft fabric offers efficient moisture transport, great cooling and helps you work out with optimal body temperature also on hot days. In addition, the singlet features mesh panels for enhanced ventilation. 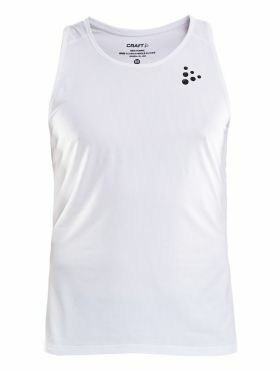 The Craft Shade sleeveless running shirt white men is a thin running singlet made of a functional fabric with UPF 50+. The soft fabric offers efficient moisture transport, great cooling and helps you work out with optimal body temperature also on hot days. In addition, the singlet features mesh panels for enhanced ventilation. The Craft Shade long sleeve running shirt black women is a thin long-sleeve tee that protects against the sun’s harmful UV rays. The jersey is a perfect choice for runners with sensitive skin or for those who often run in sunny and warm conditions. The soft fabric offers efficient moisture transport, great cooling and helps you work out with optimal body temperature also on hot days. In addition, the item features mesh in armpits for targeted ventilation and longer back for extra protection. 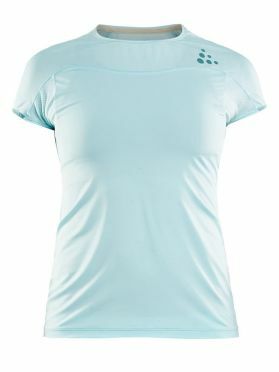 The Craft Shade short sleeve running shirt blue women is a thin running tee that protects against the sun’s harmful UV rays. The tee is a perfect choice for runners with sensitive skin or for those who often run in sunny and warm conditions. The soft fabric offers efficient moisture transport, great cooling and helps you work out with optimal body temperature also on hot days. In addition, the tee features mesh in armpits for targeted ventilation. The Craft Shade short sleeve running shirt black/white women is a thin running tee that protects against the sun’s harmful UV rays. The tee is a perfect choice for runners with sensitive skin or for those who often run in sunny and warm conditions. The soft fabric offers efficient moisture transport, great cooling and helps you work out with optimal body temperature also on hot days. In addition, the tee features mesh in armpits for targeted ventilation. 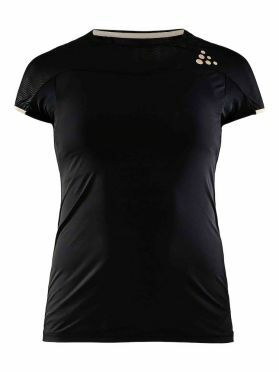 The Craft Shade short sleeve running shirt black women is a thin running tee that protects against the sun’s harmful UV rays. The tee is a perfect choice for runners with sensitive skin or for those who often run in sunny and warm conditions. The soft fabric offers efficient moisture transport, great cooling and helps you work out with optimal body temperature also on hot days. In addition, the tee features mesh in armpits for targeted ventilation.